The #1 bailment pool company in the southeast, Dealers Truck Equipment Company Inc., has teamed up with one of the nation’s fastest growing truck bed manufactures, CM Truck Beds, to bring the customer a one of a kind, Exclusive ID Truck Bed. 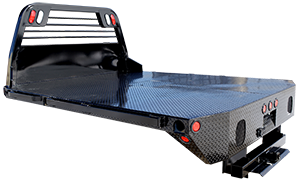 While keeping the quality standards CM Truck Beds are known for, and a sleek look to match any truck model, this unique truck bed offers some select first-class features. The solid one piece rear skirt is outfitted with expanded metal covered lights, standard 7 way and 4 way flat plugs receptacle, and a 14,500 lb. independently rated B&W steel drop hitch with full access receiver and intergraded safety chain loops. Staying true to form, this all steel frame construction has 4” steel channel frame rails, 3” steel roll-formed 3/16” channel cross-members, with a plug and play wiring harness. The 11 gauge steel tread plate deck is equipped with a 25,000 lb. independently rated B&W gooseneck hitch with easy access removable cover and intergraded safety chain loops. All this is rounded out with smooth side rails with internal stake pockets, removable 4” tall side rails and a premium polyester black powder-coated finish. So for all your truck upfitting needs, come to Dealers Truck Equipment Company Inc. and get fitted with a handpicked ID Truck Bed form a company who has the motto “Built to work. Built to Last.,” CM Truck Beds.